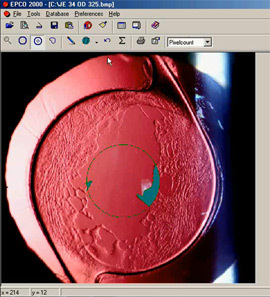 Imaging the implanted intraocular lens (IOL) and crystalline lens capsule allows monitoring of PCO progression and grading of PCO severity.2 This information is used by surgeons to determine when clinical intervention is required to improve lens clarity (usually with YAG laser removal) and therefore, vision. We are currently using the Evaluation of Posterior Capsular Opacification (EPCO-2000) software system5 to image, quantify and monitor PCO progression from digital slit lamp photographs (using fundal retro-illumination). Figure 1 displays a typical case of PCO captured during image analysis. We are also developing a new hand-held retro-illumination imaging device and bespoke software to evaluate PCO severity objectively and across multiple sites with standardised instrumentation. Figure 1. An example of posterior capsular opacification (PCO) captured during assessment using the Evaluation of Posterior Capsular Opacification (EPCO-2000) system. Spalton DJ. Posterior capsular opacification after cataract surgery. Eye (Lond). 1999; 13 (Pt 3b):489-492. Barman SA, Hollick EJ, Boyce JF, et al. Quantification of posterior capsular opacification in digital images after cataract surgery. Invest Ophthalmol Vis Sci. 2000; 41:3882-3892. Hayashi K, Hayashi H, Nakao F & Hayashi F. In vivo quantitative measurement of posterior capsule opacification after extracapsular cataract surgery. Am J Ophthalmol. 1998; 125:837-843. Tanaka Y, Kato S, Miyata K, et al. Limitation of Scheimpflug videophotography system in quantifying posterior capsule opacification after intraocular lens implantation. Am J Ophthalmol. 2004; 137:732-735. Tetz MR & Nimsgern C. Posterior capsule opacification. Part 2: Clinical findings. J Cataract Refract Surg. 1999; 25:1662-74.